4) Recalling a Naive Bayesian Classifier for Classification. 3) Recalling a Naive Bayesian Classifier for P.
One of the benefits of using a Bayesian classifier is that it can return initiative probabilities which, ideally, should be fairly well calibrated to the actual environment. For example, suppose that a 30% P of rain is produced by a weather station for 100 days, if it were to rain on 30 of those days, that would be considered to be a well calibrated model. It follows that quite often it is not just the classification that is of interest, but the probability of a classification being accurate. Horizontally the P will sum to one, and evidences clearly the most dominant class. Anecdotally, the calibration of P in naive Bayesian models can be somewhat disappointing, while the overarching classification and be surprisingly accurate. 2) Training a Naive Bayesian Classifier. Run the line of script to console. 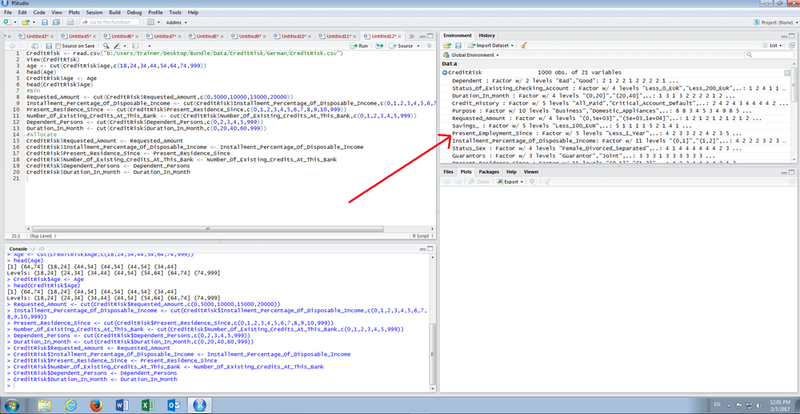 The BayesModel object now contains a model that can be used to make P predictions as well as classifications. 1) Converting Continuous Data to Categorical Data. Start by loading the CreditRisk dataset using the base read.csv() function, to assure that strings are converted to factors. · 75 Years or older. It can be seen that the continuous variable has been transformed. This procedure requires a lot of typing and to facilitate smooth learning, a copy of the procedure has been saved in Bundle\R\Cut.r. In R09 Naive Bayesian Tags R, Machine Learning, Predictive Analytics, Prescriptive Analytics, Naive Bayesian, Converting Continuous Data to Categorical Data.